Learning about what to expect after Achilles tendon surgery is very important, as taking up the surgical procedure is not the biggest challenge. The surgery is just one small step towards having a healthier Achilles tendon. Here are some of the important things that you should be aware of, for complete Achilles tendon recovery. You need to be aware of the risks that can rise after Achilles tendon surgery in order to take the necessary measures and opt for medical help when required. Given below are some of the common problems that people face post Achilles tendonitis treatment. People often complain of pain after Achilles tendon surgery. 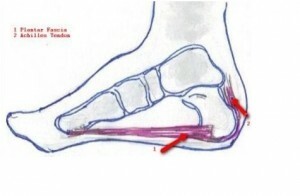 In general, there are two types of pain that you can face after Achilles tendon surgery. The first is muscle pain. As the tendon ends are repaired and fixed, the tension between the tendon and the muscle increases slowly. That is, as the tendon starts to stretch, the muscle expands, and vice versa. So any pain in the tendon can also be felt in the neighboring muscles. Doctors generally prescribe Vicodin for the muscle pain. Vicodin is addictive, so make sure that you consult with the doctor about the exact amount you need to take and for how long. The second type of pain that patients generally experience is nerve pain. This happens after open Achilles tendon surgery and it is because the nerves which are closer to the tendons are traumatized. It is better to consult a doctor in case of nerve pain. Such pain generally lasts for about three months and should subdue by then. During Achilles tendon surgery, deep vein thrombosis or clots can also occur if there is a problem with the surgery. This is because the surgeon operates at the ankle which is very close to the blood vessels and the formation of any clot could hamper the healing process of the tendon. Clotting also occurs because of the thickening of the blood. Doctors prescribe blood thinners for the first 2-3 weeks to ensure that no clots are formed. Infections are a serious risk in any post operative phase. In cases where the operated area is the leg, the risks can only increase. It is true that the risk of infections has been considerably decreased in the past 20 years but the risk is still present. It is important that the operated area be left clean and it is better to see a doctor or a nurse for any change in bandage. There are many antibiotics given to prevent infections after Achilles tendon surgery and these should be taken in a timely manner. It is important to stay at home during the first two to three months after the surgery to reduce the rate of infection. After Achilles tendon surgery is done, the operated area is covered neatly with bandages and the doctors will put you in either a CAM walker (short walker) or a cast so as to ensure that all movement, voluntary or involuntary, is restricted. Most doctors now prescribe walking as a must after the first week as it helps the tendons to realize the body’s weight and get used to it. Your nurse and the doctors will go over the dos and don’ts after the surgery and will explain the correct dosage of the medicines that are to be taken. You need to eat healthy food during the post operative phase after Achilles tendon surgery and get good rest, so ensure that you follow your doctor’s orders. This entry was posted in Achilles Tendon Rupture and tagged after achilles tendon, after achilles tendon surgery, pain after achilles tendon, post achilles tendon surgery by Zipheal Editorial Staff. Bookmark the permalink.